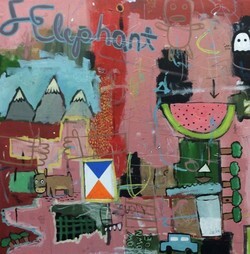 The work of former SFA art student John Storm of Waco is among the pieces exhibited in the SFA Alumni Invitational Showcase, which runs from Jan. 30 through May 3 in Griffith Fine Art Gallery on the SFA campus. NACOGDOCHES, Texas - The SFA Alumni Invitational Showcase runs from Jan. 30 through May 3 in Griffith Fine Art Gallery on the campus of Stephen F. Austin State University. The exhibition features works by former SFA art students and includes paintings, drawings, sculpture, metal work, ceramics and mixed media. SFA art alumni whose works are featured include Texas artists Daniel Baugh, Santiago Escobedo and Dan Grissom, all of Austin; Michael Blome and Holly Haynes of Houston; Kyley Cantwell of Florence; Valerie Hanks of Huntsville; Kyle Rogers of Spring; and John Storm of Waco. Other artists include Bill Brunken of Slippery Rock, Pennsylvania; Tanna Burchinal of Wichita, Kansas; Kira Enriquez of Terre Haute, Indiana; Corey Lamb of Evansville, Indiana; Isaac Powell of Richmond, Kentucky; and Kylie Price of Cullowhee, North Carolina. The artists have been invited to discuss their work. An artists' talk and reception is planned for 5:30 to 7 p.m. Friday, Feb. 8, in Griffith Gallery, located in the Griffith Fine Arts Building, 2222 Alumni Drive. Admission is free. Hours for Griffith Gallery are 12:30 to 5 p.m. Tuesday through Friday during fall and spring semesters and 6 to 7:30 p.m. before most performances in W.M. Turner Auditorium, which is directly across the hall from the gallery. The gallery can also be opened for groups by appointment by calling (936) 468-1131 or (936) 468-6557. For information about other art exhibitions, call (936) 468-1131.